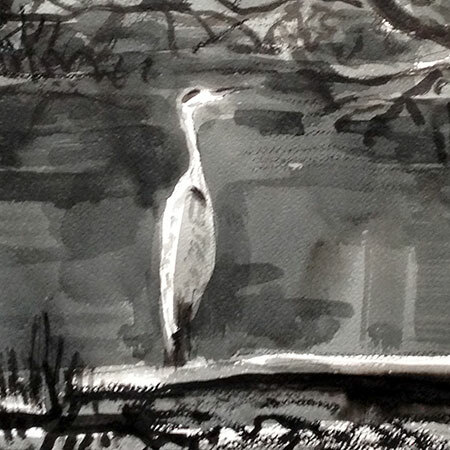 The grayscale watercolor above was painted in about 45 minutes about a month ago from the Pleasant Street bridge near my house. It's about 18 x 24 inches. 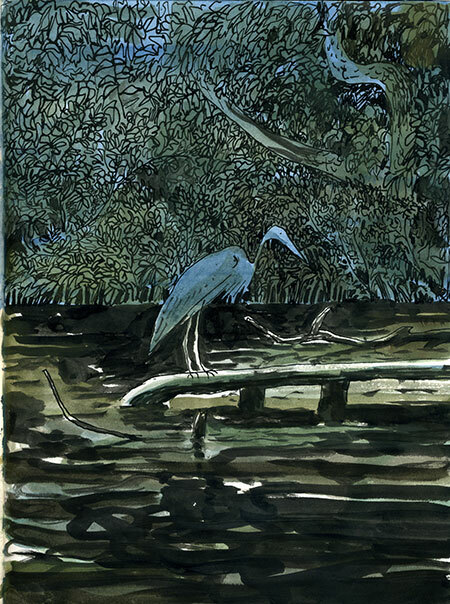 The next morning I drew a similar image of a heron in my sketchbook. I just finished it a few days ago. A friend compared the colored image, a studio work, to Japanese lacquer art. I think she was responding to the detail, small scale and limited color. And the bird of course! This got me thinking of a Japanese artist I've taken a recent interest in: Shibata Zeshin (1. wikipedia 2. MFA Boston collections). Shibata Zeshin made paintings, prints and lacquerware in 19th century Edo. He straddled the late-Edo and Meiji eras of Japanese history. His work is well-regarded, interesting and very well made. For some observers however, he is too modern and pandering to Western art or too conservative to cause a ripple in the very self-aware universe of Japanese art. I think that many artists and illustrators find themselves somewhere in a similar divided dilemma: paying homage to tradition and paying homage to the tradition of inventiveness. Such is the life of the artist. Best to let the work lead where it will and tune out the many voices that comment and critique. ......tune out the many voices that comment and critique, but that is not easy au contraire, it is very difficult. Thanks Rob, for the drawings, and the link to japanese art. 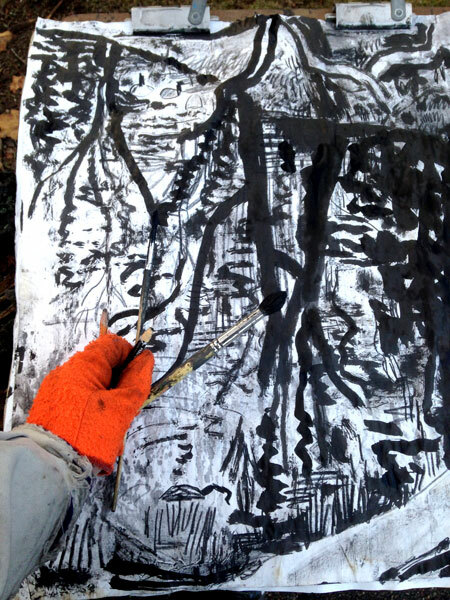 I saw your video portrait on vimeo, good feeling to see you, hear you talking and drawing. Your studio is inspiring, wonderful, like it very much, I remember you wrote about that studio some years ago, and since then I like it. Best wishes, Klaus. PS. Really, I thought of you when I saw the ducks, and made the video.